Anna Rozwadowska, Environmental Management Specialist, Freelance Writer, M.A. This is a story about success. It is also a story about failure to achieve success. Mainly, it is about redefining success. So you’ve got it packed down. You achieved a PhD with four grueling years of hard work and dedication. You have climbed the corporate ladder, as a woman I may add, and you hold a managerial position with thirty employees under your wing. You are happily married with two wonderfully bright children (due in part to your large consumption of walnuts and fish oil while pregnant), who excel in everything. You own your house; the mortgage is paid off, your husband is a successful ‘corporate type’ who owns his business and travels around the world, your house is the size of football field, the fence is white, you volunteer and are generally liked by everyone that you meet. In all instances of modern day definitions of success, you are a highly successful person. You may even be on the Forbes list, God only knows. You are successful in this world and that is the end of that story. My father died of cancer. He put up an incredible fight until the very end, and I watched him battle this terrible disease that ravaged him physically, mentally and emotionally, and as a man of faith, he said his last rites, preparing for the inevitable. My father died of cancer. I watched for eight months, day by day, as he melted into the pot of the tumor that left him rendered functionally disabled, where every small crumble that entered his mouth was astonishing and successful, for all of us. He died shortly after, and I knew that the moment his Spirit gave up hope of recovery was the moment that he was ready to enter the kingdom. My father died of cancer, and, I would consider him, even in his final moments, the most successful person that I have ever met. Now, I know this may not make any sense, so let me explain. I am a sociologist, a philosopher and pseudo psychologist by training and interest. I am also a highly spiritual person and I learn by watching what goes on around me and in the world; microcosm to macrocosm. This is my personal evolution, spiritual consciousness, higher awareness, whichever term you may employ, I use experiences to elevate my understanding of life deep within my heart and soul (and my mind too, of course). However, it is my belief and now solid understanding, that true learning happens deep within the heart and soul or Spirit of an individual. The mind may process information, but it is the heart and soul that truly comprehend at the deepest level of existence. This is how we know what is most important for our evolution and for our evolution collectively on this planet, as spiritual beings clothed in human form. As I watched and helped my father in his journey with cancer, I was learning at the same time. That is when I really began to understand the true definition of success. Now, keep in mind that I hold a Master’s degree with an honors status, I have over fifteen years of professional experience, often landing jobs that allowed me to excel as an individual; thereby a successful person. I lived on my own, provided for myself financially, volunteered in my spare time, had a blooming social life and lived my life striving for the next successful endeavor. I was on my way towards starting a Phd. as well. By all means, I was considered a success. While running our transient and busy lives, and generally, not taking the time to question such propensities, this is how we would define success as well. This is the image and inclination that is ingrained in us since childhood, even as we watch our parents at an early age, we are subconsciously learning about successful, proper behaviors without even knowing it. Psychology research has pointed to a number of factors from childhood that can predict success. According to Nielsen & Tomaselli (2010), “recent work has shown that, in contrast to nonhuman primates, human children focus more on reproducing the specific actions used than on achieving actual outcomes when learning by imitating. From 18 months of age, children will routinely copy even arbitrary and unnecessary actions. This puzzling behavior is called overimitation.” (Nielsen. M. & Tomaselli. K. (2010). Overimitation in Kalahari Bushman Children and the Origins of Human Cultural Cognition. Psychological Science, Volume: 21 issue: 5, page(s): 729–736). Nielsen & Tomaselli further explain that this behavior may be maladaptive, but over-imitation may reflect an evolutionary trait that is necessary to the development and transmission of human culture. In layman’s terms, we learn from an early age by observing our parents and loved ones, and subconsciously repeating those patterns later on in life. Therefore, it can be deduced that what modern day society considers being a successful parental or adult model can influence a whole generation of successful or unsuccessful young adults and adults. The striving towards success is prevalent even in primate behavior, mostly in reproductive success, but what all of this is saying is that success,how it is defined in our society and how it is modeled by humans, is a notorious factor in modern day evolution. With all of this being said, it can be noted that what is considered successful has changed since the industrial age, and evolved even further with the advancement of industrialization. However, none of this matters. Not really anyways. Because my father died of terminal cancer. Because, as a result of watching him struggle day by day, I came to fully understand that what we consider success is completely irrelevant. What I learned and fully understood, deep within, is that success can be comprised of the smallest of actions. Also, that every action that came from the heart was a success. It was Thomas Jefferson that stated wisely, that “The glow of one warm thought is to me worth more than money.” (Jefferson, T. The Works of Thomas Jefferson, Vol. II (in 12 Volumes): Correspondence 1771–1779, the Summary View, and the Declaration of Independence. New York: Cosimo, Inc.). 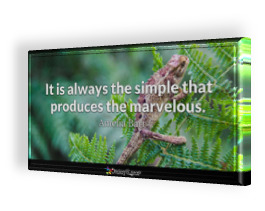 In the same line of reasoning, Amelia Barr, British novelist, and teacher of the 1800’s, was quoted saying that “It is always the simple that produces the marvelous.” (Barr, A. E. (1913). All the Days of My Life: An Autobiography: The Red Leaves of a Human Heart. New York & London: D. Appleton & Company). 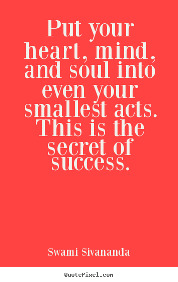 In other words, the smallest of acts could produce the greatest impact. My father was a success. A tremendous success right up until his very last breath. Why you may ask, am I considering an incapacitated man who could barely feed himself, successful? Why am I not mentioning, instead, that he toiled since the age of fourteen in the workforce? What about the fact that he did everything for his two children, was married, worked 35 years in a custodial position because his foreign credentials were not recognized in Canada, just to provide for his family? He started off scrubbing the toilets and made his way towards watching others scrub the toilets. What about his strength of character and surviving the post-communist era in Poland? What strength and tenacity. Why are these secondary to the measure of success that I cite when I discuss his fight with cancer? overcame the embarrassment of ‘losing his dignity,’ in wearing diapers because of urinary incontinence, he withstood brutal chemotherapy treatments until he lost his balance and eventually, his mental acuity. My father tried to talk when he no longer could, gestured with his hands when he lost the capacity to think, and scribbled nonsense on a piece of paper when he could no longer write. For those reasons, and for all that he was in his lifetime, he is the most successful person that I have ever known. The smallest of acts became successful in my eyes, watching my father slowly drift away into the heavens. He could not be any more successful, now that I hold his memory in my heart, because every small act was a victory, and every victory was comprised of the smallest of acts. His Spirit shined through his despair. Now, we have a very real example of success redefined. Carl Jung, a Swiss psychiatrist, and psychoanalyst who founded analytical psychology, who also worked with Sigmund Freud, said that “The least of things with a meaning is worth more in life than the greatest of things without it.” (Jung, C. G. (1933). Modern Man in Search of a Soul. New York: Harvest.) Being successful or talented doesn’t consist of any specific thing unless meaning can be found within it. Jung also espoused the power of the human heart as a driving force in action, and the ultimate teacher in life. He has been quoted saying that: “An understanding heart is everything in a teacher, and cannot be esteemed highly enough. One looks back with appreciation to the brilliant teachers, but with gratitude to those who touched our human feeling. The curriculum is so much necessary raw material, but warmth is the vital element for the growing plant and for the soul of the child.” (Jung, C. G. (1954). The Development of Personality. Princeton, N.J.: Princeton University Press). Jung essentially said that the warmth of the human heart was a better measure of success than any material structure. My father was love in action; a sick man who demonstrated that, as C.C. 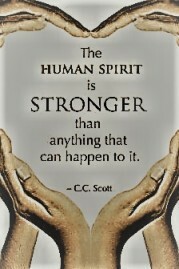 Scott put it, “The human Spirit is stronger than anything that can happen to it.” (Forbes Magazine. (1997). Thoughts on Courage: Thoughts and Reflections from History’s Great Thinkers. Triumph Books, U.S.: Princeton University Press.) In fact, it is the human Spirit that keeps a person alive for as long as they have signed up for in this earthly realm. And, it is the human heart which empowers actions that embody success, according to the higher consciousness of the 21st Century and moving forward from here. Collectively, we know that Hawking had a tremendous impact on the advancement of astrophysics and an intelligence system that was far beyond our time. Hawking remained adamant that people retain their curiosity and shared his enthusiasm for the advancements in not only science but the human(e) understandings that the Universe afforded. He has gone on record to say that: “…however difficult life may seem, there is always something you can do, and succeed at. 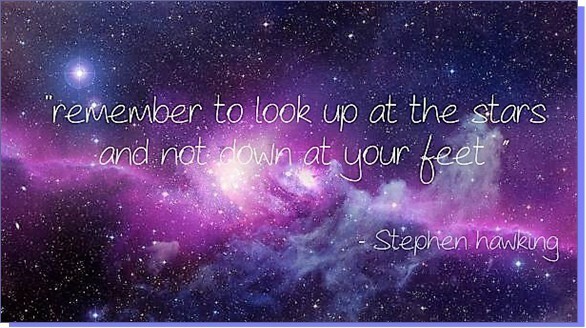 It matters that you don’t just give up.” (Hawking’s Speech: Remember to look up at the stars and not down at your feet. Cambridge University, 2012). Hawking recognized that the smallest acts can constitute success. My father didn’t give up until the very end of his life. Although we will never know his thought process at the time, his courageous journey with cancer and the smallest of acts that were driven by his heart’s desire to live made him extremely successful. Perhaps he didn’t feel that way, but I certainly did. Perhaps he felt it, too. His ability to withstand the severe deterioration of his basic level functioning, while scribbling words on paper to express his wishes and desires made him successful. My father, and your father, mother, siblings, friends, relatives, all of humanity can indeed be successful if only we can further our understanding of success to include the heart, mind, Spirit, and body, and the smallest of acts of determination. I have an M.A. in Environmental Sociology and over 15 years of professional career experience. I am a freelance writer, editor, researcher, photographer, psychic, medium and spiritual guide as well.